Extensions of deep fascia as medial and lateral intermuscular septum divides arm in anterior and posterio compartments. Medial and lateral intermuscular septum are atteched to medila and lateral supracondylar ridge of humerus respectively. Medial intermuscular septum is pierced by ulnar nerve, superior ulnar collateral artery in the middle. Lateral intermuscular septum is pierced by radial nerve, radial collateral branch of profunda brachii artery. These septa also provide surface for origin of muscles. are muscles present in anterior compartment of arm. Origin: It shows origin from tip of coracoid process along with origin of short head of biceps brachii. Insertion: It shows insertion on medial border of middle part of humerus. Action: Flexion of arm at shoulder joint. Origin: It has two heads of origin short head and long head. Short head shows origin from tip of coracoid processor alongwith origin of coracobrachialis. Long head shows intracapsular origin from supraglenoid tubercle inside capsule of shoulder joint. Insertion: It shows insertion on posterior part of radial tuberosity. Tendon near insertion gives out of fibrous expansion medially bicipital aponeurosis. This aponeurosis shows attachment on upper part of posterior border of ulna with deep fascia. Action: supination of forearm, flexion at elbow joint, long head of biceps during abduction at shoulder joint prevent dislocation of head of humerus and keep it in contact with glenoid fossa. Origin: It shows origin from anteromedial and anterolateral surface of lower half of humerus. Insertion: It shows insertion on anterior surface of coronoid process and ulnar tuberosity. Nerve supply: musculocutaneous nerve supply this muscle only some lateral lower part of muscle receive nerve supply from radial nerve. Action: flexion at elbow joint. Axillary artery continue as brachial artery in front of arm. It runs up to the cubital fossa and dividing into radial and ulnar artery. Course: it runs downwards and laterally. At first it lies medial to humerus. Median nerve crosses from lateral to medial side in the middle. 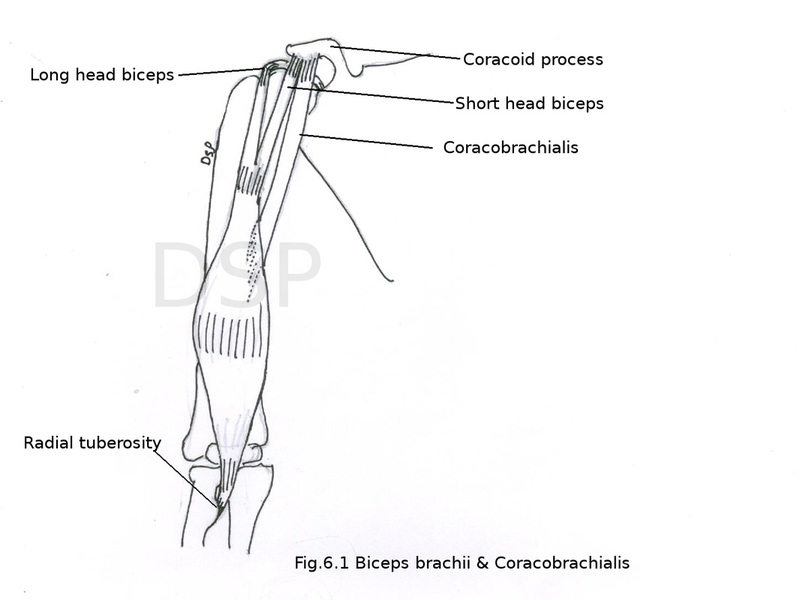 Posteriorly runs on the surface of the long head of triceps, coracobrachialis and brachialis. Median nerve lies laterally in upper part and bicep brachii with its tendon lies laterally in lower part. Ulnar nerve lies medially in upper part and median nerve lies medially in lower part. It arises in upper part of arm. Goes to posterior compartment after piercing medial intermuscular septum. Ulnar nerve runs alongwith this artery. This artery anastomoses with posterior ulnar recurrent artery and inferior collateral arteries in lower part of arm. It arises in lower part of arm. It divide into two branches anterior and posterior. Anterior branch anastomoses with anterior ulnar collateral artery and posterior branch anastomoses with superior ulnar collateral artery and posterior ulnar recurrent arteries around elbow joint. It arises in upper part and with radial nerve goes to spiral groove on posterior surface of humerus. 4. Nutrient artery to humerus. 5. Muscular branches to muscles present. 6. Radial artery is a terminal branch. 7. Ulnar artery is a terminal branch. For recording of blood pressure this artery palpated in cubital fossa. It is a branch of lateral cord of brachial plexus. It pierces coracobrachialis muscle. Then runs laterally and downwards passes between biceps brachii and brachilis. Finally it pierces deep fascia and continue as lateral cutaneous nerve of forearm. 1. Muscular: It supplies coracobrachialis, biceps brachii and brachialis muscle. 2. Cutaneous branches: Lateral cutaneous nerve of forearm supply lateral side forearm up to wrist joint. 3. Articular branches small articular branches for elbow joint. Median nerve after its formation in axilla lies lateral to axillary artery in arm. It lies lateral to brachial artery in the middle part of arm. It crosses brachial artery in lower part of arm and it lies medial to brachial artery. 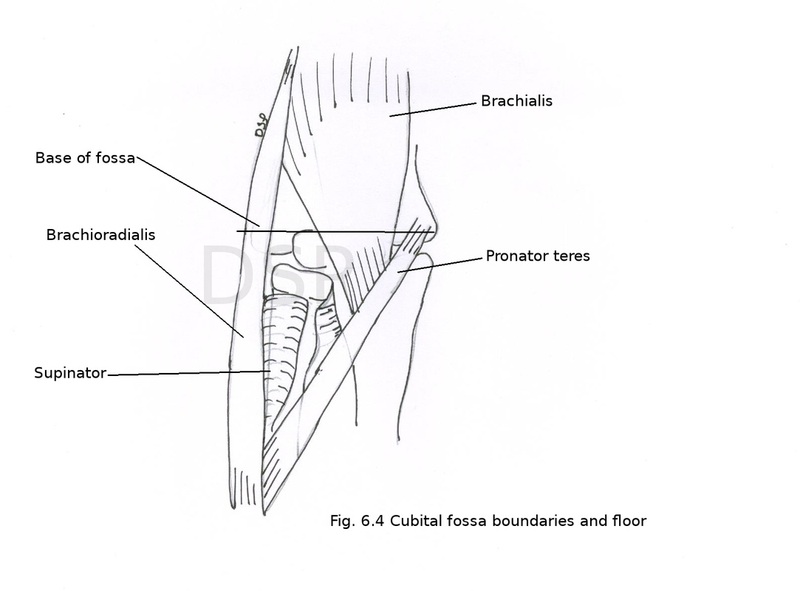 Then it enters in cubital fossa fossa and passes between two heads of pronator teres muscle. 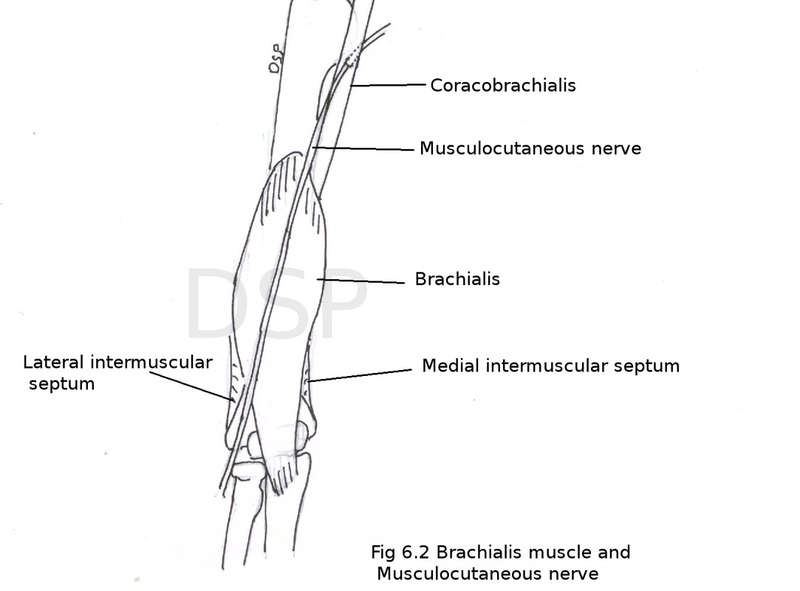 Branch to pronator a teres is only branch of median nerve in arm. After formation of ulnar nerve in axilla. It enter in medial part of arm with medial cutaneous nerve of forearm. It pierces medial intermuscular septum and goes downwards and lies posterior to medial epicondyle of humerus. After its formation radial nerve goes backwards and laterally passes through radial groove alongwith profunda brachii artery. In the lower part of arm it pierces lateral intermuscular septum to become anterior then it passes downwards between a brachioradialis and extensor carpi radialis longus. Branches during its course it supply brachioradialis, extensor carpi radialis longus and lateral part of brachialis muscle. It is a triangle like space between muscles and imaginary line anterior to elbow joint. Laterally: medial border of brachioradialis. Medially: lateral border of pronator teres. Apex: It is downward and formed by margins of muscles which form lateral and medial boundaries. Base: It is formed by an imaginary line which joins medial and lateral epicondyle of humerus. Floor: It is formed by supinator and brachialis muscles. Roof: It is formed by skin, superficial fascia, deep fascia and bicipital aponeurosis. Median cubital vein, medial and lateral cutaneous nerves of forearm are present in roof. Contents: From medial to lateral side following contents are visible. Goes straight downwards and passes in between two heads of pronator teres. During its course it gives a small branch to pronator teres. Brachial artery lies medial to tendon of biceps brachii and here it is palpated for its pulsations. Artery divide into 2 terminal branches radial artery and ulnar artery. Radial artery is a small branch which runs downwards and laterally during its course it gives out a branch radial recurrent artery. Ulnar artery is a large terminal branch which goes downward and medially. Then it passes deep to ulnar head of pronator teres. In its course it gives out branches anterior ulnar recurrent artery, posterior ulnar recurrent artery and common interaosseous artery. Tendon of biceps muscle along with bicipital aponeurosis present just medial to brachial artery. 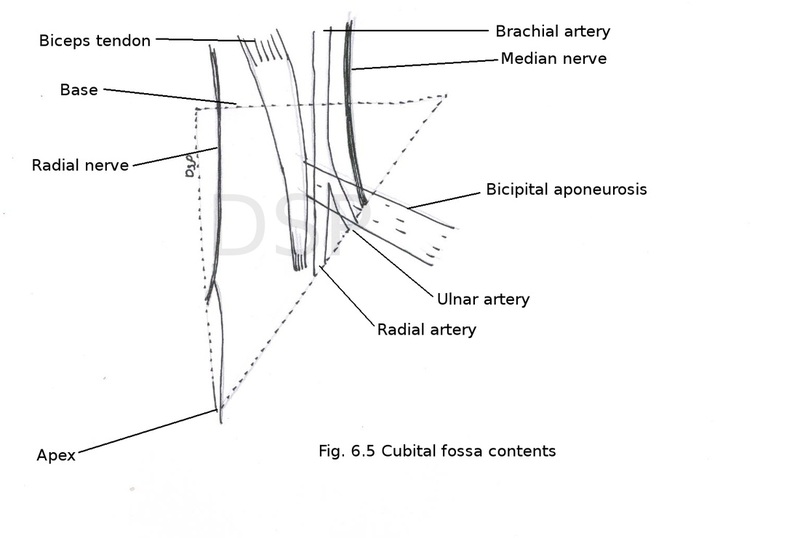 Radial nerve appears in the lateral part of cubital fossa. Here it appears in between brachioradialis and brachialis and extensor carpi radialis longus muscles. It gives two branches superficial and deep. Superficial branch continue downward as cutaneous branch. Deep branch runs as posterior intraosseous nerve. It goes to extensor compartment of fore arm by piercing supinator muscle. Here it supply brachialis, brachioradialis, extensor carpi radialis longus and brevis. 1.Brachial artery used for recording blood pressure in cubital fossa. 2. Median cubital vein present in relation with cubital fossa used for intravenous infusion and intravenous injections. This comparment contents mainly triceps muscle, radial nerve and profunda brachii vessels and a part of ulnar nerve in lower part of this region. Origin: Long head shows origin from infraglenoid tubercle of scapula, lateral head shows origin from oblique ridge in relation to spiral groove, medial head shows origin from posterior surface of humerus below spiral groove also from medial and lateral inter muscular septum. Insertion: Long head and lateral head goes downwards join with each other and form a flat tendon which is superficial to medial head and shows insertion on posterior part of upper surface of olecranon process. 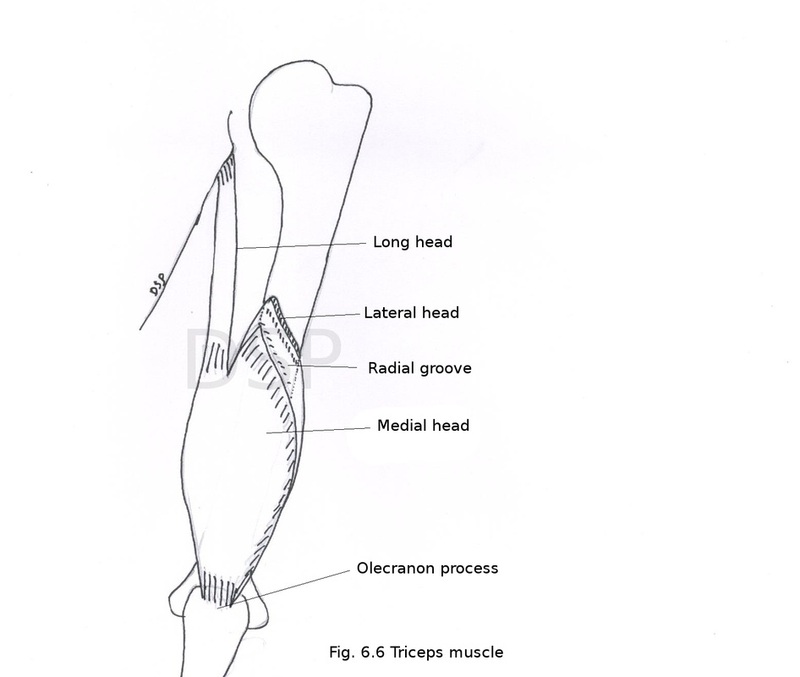 medial head shows insertion on flat tendon formed by long head and lateral head and some part of this head shows insertion on olecranon process deep to insertion of flat tendon. Action: it is a powerful extensor of elbow joint. During abduction at shoulder joint long head of triceps support head of humerus at shoulder joint. It is branch of posterior cord of brachial plexus C5 C6 C7 C8 T1. This nerve lies posterior to brachial artery. Passes on posterior surface of humerus along with profunda brachii vessels enter inside spiral groove after passing through lower triangular space. In spiral groove it passes between medial and lateral head of triceps. In lower part of humerus it pierce lateral intermuscular septum and come in anterior comparment. Muscular branches: to long and medial head of triceps before entering into spiral groove. In spiral groove braches to medial and lateral head of triceps. Below radial groove it gives branches to brachialis, brachioradialis and extensor carpi radialis longus. 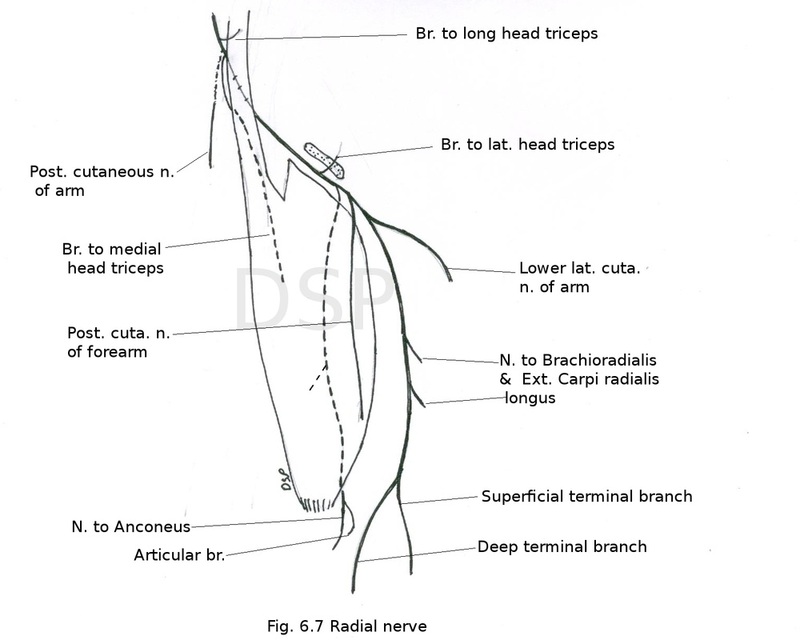 b. lower lateral cutaneous nerve of arm supply posterior surface and lateral surface of arm. Injury to radial nerve causes loss of extension at wrist joint, wrist drop and loss of sensation on back of forearm medial side of dorsal surface of hand. It is a large branch of brachial artery passes in relation to posterior surface of humerus. In upper part accompanied by radial nerve in radial groove. 1. Anterior descending branch or radial collateral branch: It anastomoses with radial recurrent artery anterior to lateral epicondyle of humerus. 2. Posterior descending artery or middle collateral artery: It anastomoses with interosseous recurrent artery posterior to lateral epicondyle of humerus. 3. Ascending or deltoid branch: It goes upwards between long head and lateral head of triceps anastomoses with descending branch of posterior circumflex humeral artery. Anastomosis around elbow joint connect branches of brachial artery with branches of radial and ulnar artery. This anastomosis is for normal flow of blood during flexion and extension of elbow joint. 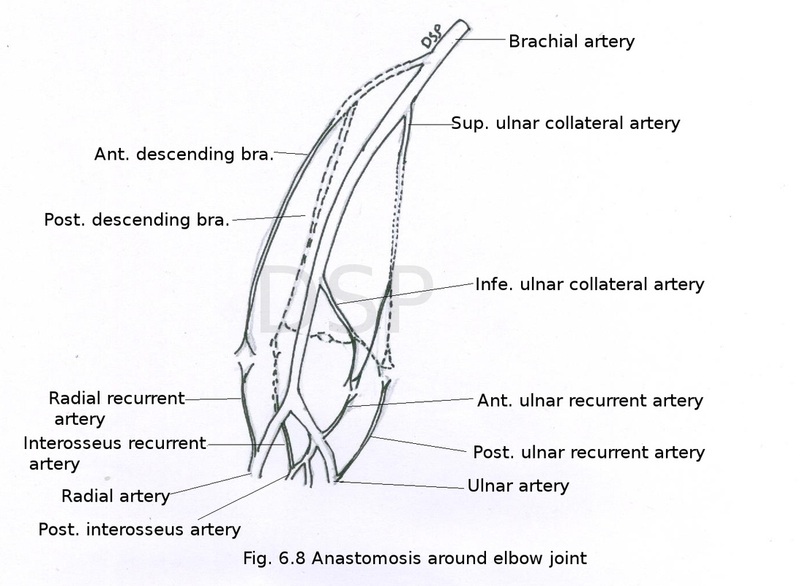 Superior and inferior ulnar collateral artery (branches of brachial artery) anastomoses with anterior ulnar recurrent artery (branch of ulnar artery). 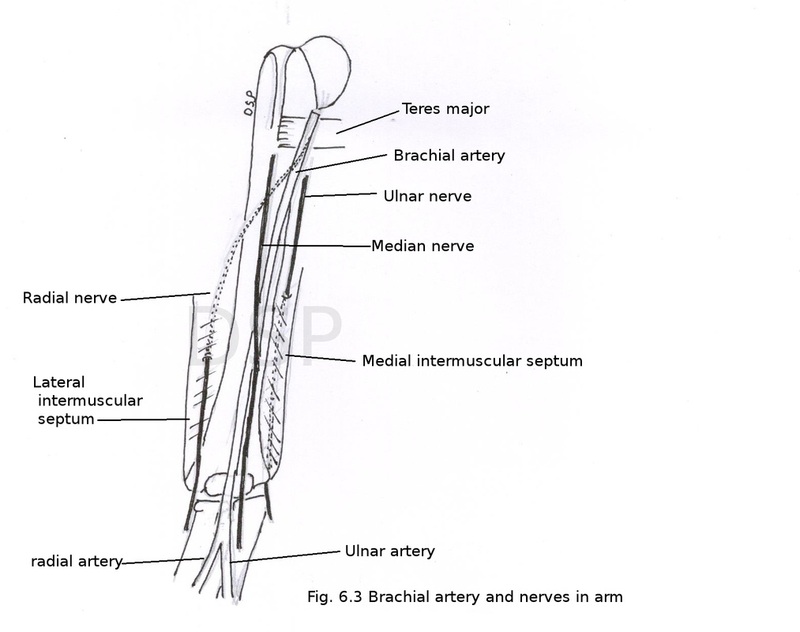 Superior ulnar collateral artery and a small branch from inferior ulnar collateral artery (branches of brachial artery) anastomoses with posterior ulnar recurrent artery (branch of ulnar artery). Radial collateral (branch of profunda brachii artery it is branch of brachial artery) anastomoses with radial recurrent (branch of radial artery). Posterior descending (branch of profunda brachii artery) anastomoses with interosseous recurrent (branch of posterior interosseous artery). Posterior descending (branch of profunda brachii artery) and a transverse branch from posterior division of inferior ulnar collateral artery.